Well Linszoid, I dunno what to tell you except... "Can we talk?" BB-8 is BB-9. SOOOO CLOOSE. Terminator vs BB-8, featuring Dot from Reboot, coming to you from Marvel, IDW and Boom comics this fall! Let's get this thing made! WALL-E is a robot from the film of the same name. WALL-E is one of many robots designed to compress and organize garbage on a heavily polluted and abandoned Earth. After hundreds of years on the job, he appeared to be the last one still in operation. After finding a small plant, WALL-E encountered EVE, a robot designed to find signs of plant-life on Earth. The two became close but when EVE found WALL-E's plant, she followed her programming to take it back. WALL-E stowed away on her ship and began a grand adventure to change human destiny. WALL-E is a lonely robot who has developed a number of collections among the junk he has found over the years. He is somewhat guileless and accident-prone, but he is always friendly and works to help others. He proves to be brave and clever in the face of a real threat and is talented at making friends. WALL-E was able to survive for so long by taking pieces from broken robots and using them as replacement parts for himself. Trivia WALL-E stands for: Waste Allocation Load Lifter: Earth Class. Wall-E is IMO the best movie Pixar has ever made. One of the best movies anyone has ever made. It's amazing how much they managed to get a robot to emote. WALL-E is one of the few movies to not have any dialogue for the first 30 minutes of the film. Well, I think there are a lot of silent movies that also count. Oh, wait, let me use a more recognizable photo. C-3PO is a protocol droid who appears in the Star Wars franchise. He was created by Anakin Skywalker and yadda yadda yadda, ignoring the prequels, blah blah blah and yeah, he was with the rebel alliance when the ship he was on was under attack by the Galactic Empire. After escaping, he and his life partner, R2-D2, where found by farmer Luke Skywalker, who learned the R2-D2 had a secret message. Soon, C-3PO rejoined the rebellion, spending most of the time complaining. C-3PO is a very polite robot, though he seems oblivious to the fact that his stuffy attitude is often off-putting to his compatriots. He tends to work with R2-D2, though the two are often at odds, with C-3PO often being the more conservative and cautious of the two, often to a fault. 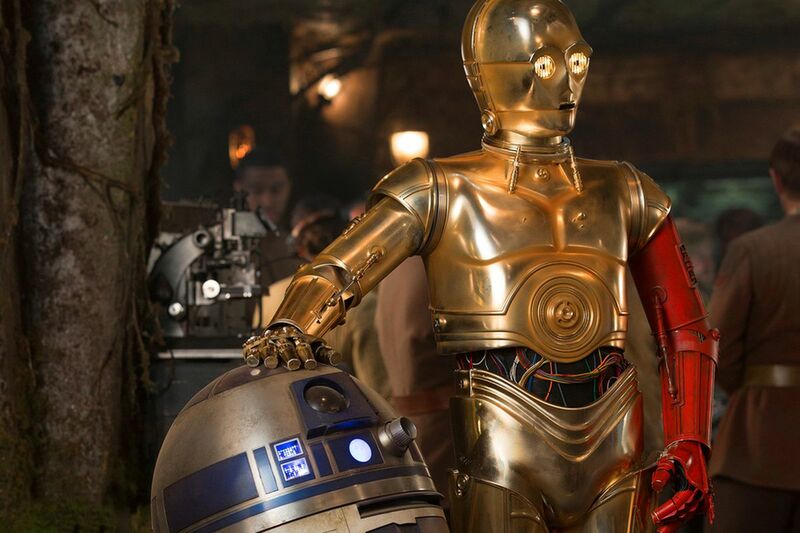 C-3PO claims to work with human-cyborg relations, a comment that is, like, never followed up on. But his specialty, at least in theory, is diplomacy and he is capable of speaking six million languages. He is even capable speaking to Ewoks, suggesting that he can intuit other languages easily (or that despite the fact that Ewoks have little interaction with the outside work, someone took the time to map their language). Trivia Mel Blanc auditioned for the voice of C-3PO. Data is an android starfleet officer in the Star Trek franchise. He was originally built by the scientist Noonien Soong, who was looking to create a unique artificial intelligence. A tragedy left the world that Soong was on dead and Data was eventually discovered alive by Starfleet but with no memory of his past. Data would go on to join Star Fleet and was a part of the crew of the USS Enterprise. Data would go onto become one of the crew's most trusted members due to both his skill and his humanity. He would also go on to learn more about his past, including androids built before him, as well as trying to become as human as possible. Data wants more than anything to understand humanity and become human, to some degree. He constantly experiments with himself, trying to find capabilities that would allow him to be more human. He sometimes succeeds, sometimes by accident (such as when he learned of his ability to dream) and sometimes through hard work, such as his hit and miss attempts to become an artist in many fields. Data has a positronic brain, which is extremely powerful and whose limits even Data is uncertain about. Data tends to be honest by nature, sometimes to a fault due to his inability to register social cues unless they are explicitly stated. He also has a habit of getting hung up on trivia and minutiae, even when he should be focusing the conversation on something else. Trivia The genesis for the creation of Data stemmed from an earlier television project by Gene Roddenberry. In 1974, Roddenberry created an unsold pilot for a proposed series called The Questor Tapes (1974), which centered around an android studying humanity while seeking his creator. This was combined with the concept of Xon the emotion-curious Vulcan from the Star Trek: Phase II proposal of the 1970s, to coalesce into Data. You know, i really, really liked Data... then Star Trek Generations happened. I can only think of four likely candidates to fill the final five spots. One is definitely going to be a surprise for me. Marvin, AKA Marvin the Paranoid Android, is a robot who appeared in the Hitchhiker's Guide to the Galaxy franchise. Marvin was a prototype for a failed line of robots called Genuine People Personalities. Marvin later became a part of the crew of the Heart of Gold, captained by the absentee president of the galaxy and the self-appointed coolest guy in the universe Zaphod Beeblebrox. When the crew is teleported into the future, they find that Marvin had been waiting for them for 576,000,003,579 years (he counted them). Marvin is best known for two things: having the "brain the size of a planet" and being incredibly depressing. Marvin's main complaint is that despite his super-intelligence, he almost never gets to use more than the tiniest fraction of it, chafing at the idea that instead he is sent to do mundane tasks. He also seems to have a negative opinion of all things, even when said dislikes would appear to be contradictory. When kidnapped by the bellicose Krikkit robots and tied to the interfaces of their intelligent war computer, Marvin simultaneously manages to plan the entire planet's military strategy, solve "all of the major mathematical, physical, chemical, biological, sociological, philosophical, etymological, meteorological and psychological problems of the Universe except his own, three times over", and compose a number of lullabies. near destruction, he was encouraged to quest to see the last message of God to creation. When he finally saw the message, he learned it was "We apologise for the inconvenience." Marvin then felt a bit better, then died. Trivia Marvin does not actually display signs of paranoia, though Zaphod refers to him as "the Paranoid Android". Nor does he show any signs of mania, though Ford refers to him as a "manically depressed robot". He remains consistently morose throughout. In fact, he exhibits remarkable stoicism, being willing to wait hundreds of billions of years for his employers. Yay, I as starting to think Marvin wouldn't make the list.